With Zapier it's easy to integrate web apps and move data between them. 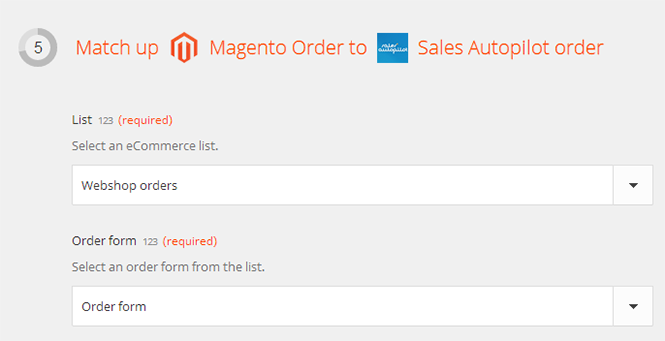 For example you can save orders the come into your Magento webshop to a Sales Autopilot eCommerce list. Click the "Accept Invite" button. 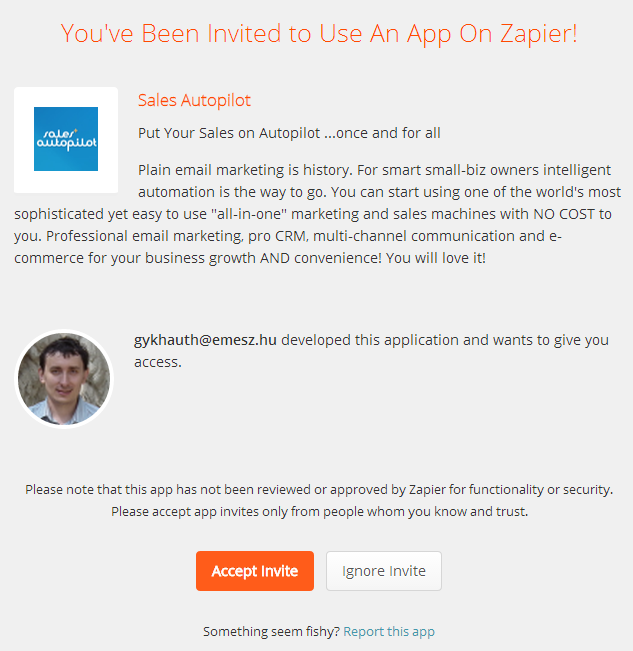 Now, you can see Sales Autopilot among Zapier apps. Click the "Make a Zap" in the header. Select Magento from the "Choose a Trigger app..." listbox. Warning: you can reach Magento integration if you use Zapier premium. From the "Choose a Trigger"/b> listbox select "Show all triggers" option first, then select "New order" Triggers when Magento gets a new order. From the "Choose an Action app.." listbox select "Sales Autopilot" then select the "Add order" option from the "Choose an Action..." listbox below. After that, click the "Continue" button. In the next step click"Connect a Magento Account". 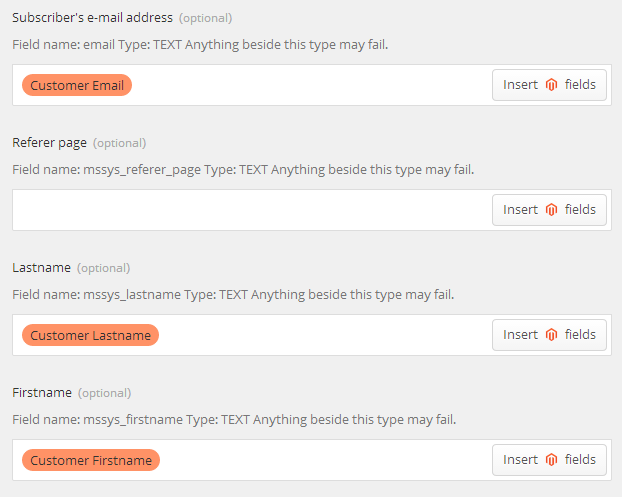 Type your Magento website URL, API username and password. If you need help creating an API user in Magento click here. In the next section click the "Connect to a Sales Autopilot account". Copy your Sales Autopilot API username and password into the proper fields. 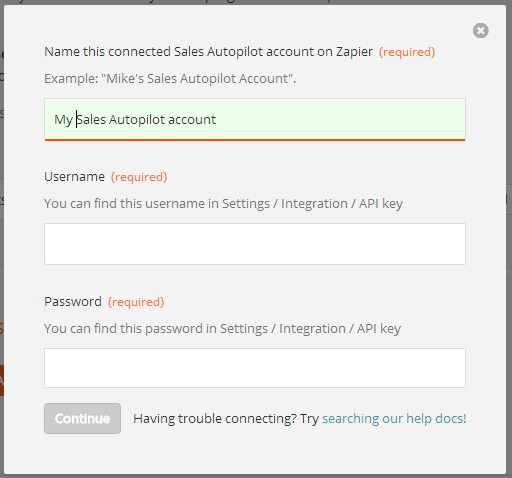 You can find your Sales Autopilot API username and password in the left menu Settings / Integration / API keys. Zapier will check your settings. If everything works fine, click "Continue". In this step you can define custom filters, if you don't want to synchronize every order with SalesAutopilot. You can also skip this step. Click "Continue". In the next step, select a Sales Autopilot Order list and then an order form. Orders coming from your webshop will be saved into the selected list. If the selected form contains any action it will be triggered as well. After you selected the form you can see the fields of the list. Based on the table below you can match Sales Autopilot fields with Magento fields. You can find SalesAutopilot fields on the screen by using the search-in-page function of your browser. To find Magento fields click the "Insert field" button and copy the Magento field name from the table. Be aware that other webshop engines may use different field names. You can match any other Magento field with a Sales Autopilot field, for example customer email address, firstname, lastname etc. After you set all the fields you want you can click "Continue". 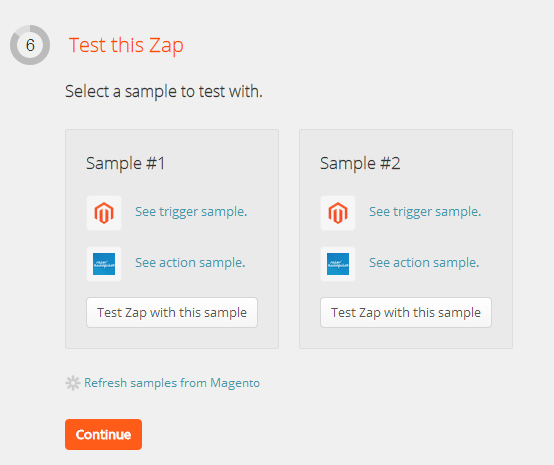 Click "Test Magento Trigger" then click "Test Zap with this sample". If everything went fine click "Continue". In the last step give a name to your Zap then click the "Turn Zap On" button to activate integration. 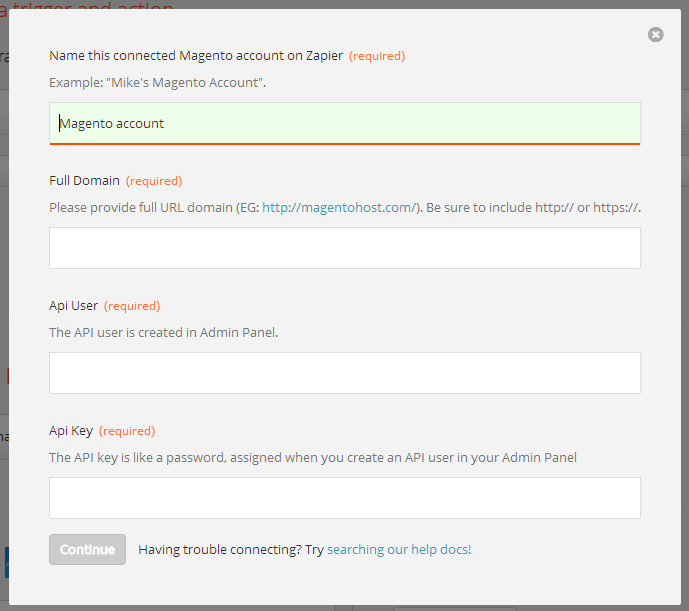 Again you have to use Zapier Premium in order to activate the Magento integration Zap. When you finished the active Zap will be displayed on the dashboard. You can track how many orders Zapier has passed on to Sales Autopilot. You can integrate SalesAutopilot with other tools like Shopify, Bigcommerce or Volusion just like the example presented above.